Cross-country skiing at Skyway, Colorado. I have a friend who started his son skiing before he could walk. And, despite how crazy this sounds, it worked. Now my friend is a ski instructor and a former US Ski Team member, so perhaps it’s in the genes. For most of us mere mortals, however, we’re lucky to get our kids on skis at age three or four. What this means for skiing parents is up to four years in limbo — trying to ski and trying to keep your toddler occupied, safe and happy — while you try to ski. If you find yourself in this position, with an infant or non-skiing toddler this winter, here are some tips from other parents who’ve been there. If you and your spouse both yearn to ski, tag-teaming may work best for you. Taking turns skiing and watching the baby at the resort can be an equitable way to divide the day. Both parents get some time with their child and both get some time on snow. The downside: You never get to ski together. Some resorts, especially smaller ones, are making it more affordable to bring baby along. Look for partial day or hourly tickets. It’s much easier to stomach sitting in the lodge if you haven’t paid for a full-day ticket. If your spouse isn’t up for tag-teaming, grab a friend who is in a similar situation and share the fun and baby duties. 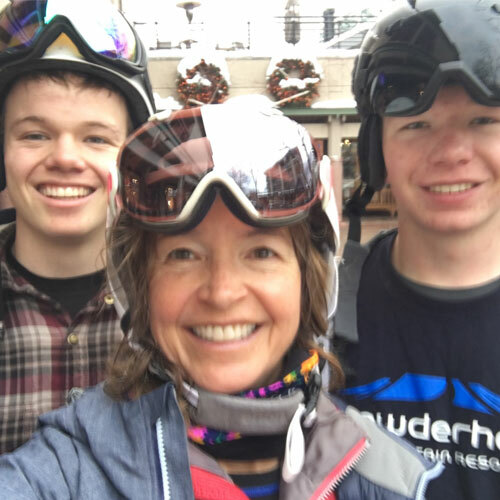 Martha of Bretton Woods Outdoor Mom shares that Bretton Woods, New Hampshire offers a special ticket for parents. Buy one regular adult ticket and two print out. These tickets share a bar code and can’t be used at the same time. But each parent can put a ticket on their coat, making it quick and easy to trade-off runs and childcare. Ask your resort if they can do something similar or have a different deal for tag-team parents. If one or both parents are going to be spending time hanging around a ski lodge with a baby or toddler, try to ski at resorts that welcome loiterers. You can only buy so much food and hot chocolate during a ski day, and after you’ve eaten your fill, you will be loitering. Make sure you’re welcome to sit and play with your child even if you don’t have food in front of you. When my friends Jessica and Andrew (Bring-the-kids.com) started skiing with their infant son, they quickly found that some of the larger Colorado mountains weren’t happy about them taking up space in the lodge. Not only that, but some of their favorite mountains didn’t have base lodges at all (all of the dining and retail action being found mid-mountain). Baby Cara’s parents take a lunch break while cross-country skiing on Grand Mesa, Colorado. Cross-country skiing with small kids is not without challenges. The first time we went out with our 6 month-old son, my husband cinched him into our sturdy baby backpack. Our son smiled, looked around, pointed at the trees and then went to sleep. And then in a freak accident, another cross-country skier ran into my husband and knocked him down. Our son woke up with his cheek on the snow, but he was fine. Make sure you have “seatbelts” in whatever backpack or front pack you use. If you’re inexperienced, stick to easy, flat, groomed trails. When our boys got too big for the backpack, we switched to a sled. We’re DIY kind of people (read “cheap”), so we jury-rigged a rope and plastic sled contraption that worked okay, but was prone to tipping over. Also, rope goes slack when you go downhill, meaning a sled can run up behind your legs or past you (à la the Grinch Who Stole Christmas). A better choice is to rent, or buy, a sled with metal poles that attach to your waist. The sled remains at a steady distance behind you and your children stay safe. Often these sleds also have cargo compartments so you can carry diapers, snacks, drinks, pictures books and extra clothes. Don’t forget hats, sunscreen and sunglasses for your little ones and you’re good to go. Great post – many of the same challenges we come up against! And thank you for your pack “seatbelt” story- way too often I see people NOT putting the buckles on thinking it is no big deal! Thanks Amelia! Yes, buckle those belts. Cheers! We’re definitely a tag teaming, lodge loitering ski family! Happy skiing. Lodge loitering is a fine art! But so much nicer than getting a sitter or having part of the family stay home! Cheer! SkiTag teaming was a common thing for us too before our now 4 year old was skiing! Our hill, Mount Washington in BC has a Wee Ski program where parents can learn how to work with their child on the snow! That is such a good idea, because no matter how many lessons a child takes, at some point, their parents will be skiing with them and giving them tips. Best if the parents have received a bit of training, too! Thanks for your comment. My daughter joined us at age 2 skiing at Big White Resort in BC. She was so miserable in the day care we rented boots…. luckily they had the size and I spent my whole week on the bunny hill! 16 years later she returned to Big White as a race coach and continues today at Lake Louise as a K1 coach. I have given her to the mountains and they keep her safe and happy. google: Lake louise ski club coaches. What a wonderful testimony! I love that you gave your daughter to the mountains and they have kept her safe and happy! Thanks for sharing and good luck to your daughter and her team!